An EF-mount lens, the Tamron 85mm f/1.8 has been specifically designed with a larger image circle for use on full-frame Canon DSLRs such as the EOS 5DS R, the 5D Mark IV, and the 1Dx Mark II. The short telephoto focal length and large maximum aperture make it a useful option for portrait photography, as well as for shooting news events, weddings, or even certain sports in low light. The SP in the lens name denotes that it’s one of Tamron’s Superior Performance optics, so we can expect some pretty decent scores. 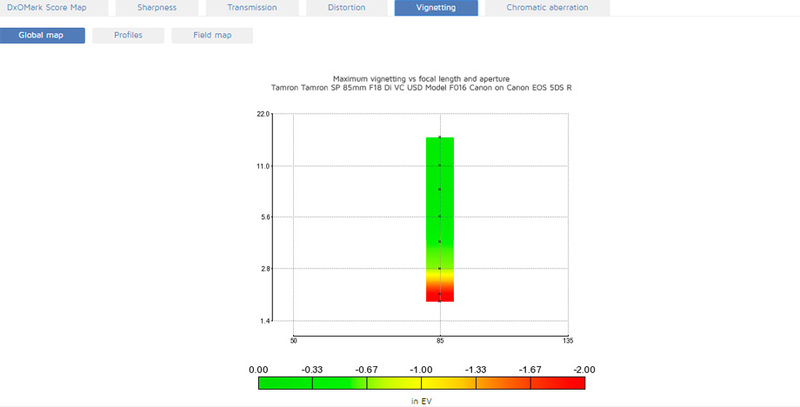 VC indicates the inclusion of Tamron’s Vibration Compensation lens-based image stabilization system. This is useful for shooting relatively static subjects in low light, allowing you to get blur-free shots with slower-than-usual shutter speeds. The lens also features Tamron’s Ultrasonic Silent Drive (USD) autofocus motor, which helps ensure quick and quiet autofocus (as well as full autofocus on entry-level DSLRs that don’t feature an autofocus motor in the camera body). 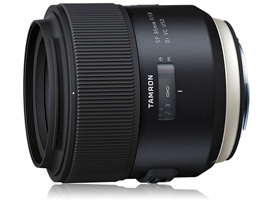 The Tamron 85mm f/1.8 is also compatible with Canon APS-C DSLRS, such as the EOS 760D, offering an equivalent 136mm focal length that, although getting a little long, remains a popular focal length for portrait and event photography on crop-sensor DSLRs. 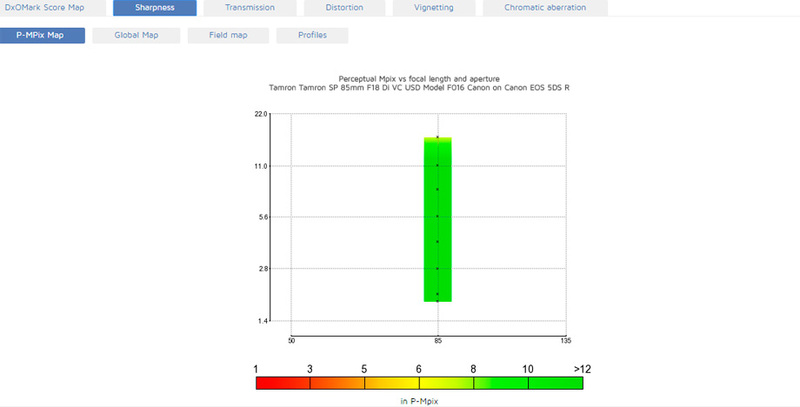 Delivering excellent all-round performance on all Canon full-frame DSLRs, the Tamron 85mm f/1.8 achieves a top score of 42 points on the 50.6Mp EOS 5DS R.
Sharpness is outstanding, scoring 38 P-Mpix on the 5DS R, and offering high levels of uniform resolution at all aperture settings, including wide-open at f/1.8. 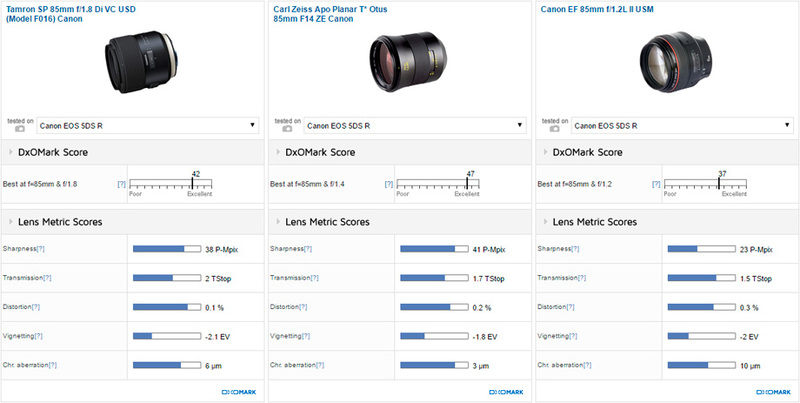 Despite lower overall and sharpness scores of 37 points and 27 P-Mpix on the 30.4Mp Canon 5D Mark IV, as well as 34 points and 19 P-Mpix on the 20.2Mp Canon 1Dx Mark II, the Tamron 85mm f/1.8 actually realizes more of the resolution potential of these DSLRs. Excellent light transmission of 2 TStop ensures lots of light for a bright viewfinder image and autofocus sensor, which should ensure good low-light autofocus performance. The Tamron 85mm f/1.8 also controls chromatic aberration extremely well, with very little visible fringing at any aperture; and there’s virtually no geometric distortion (as you’d expect from a prime lens of this focal length). The only slight quibble is fairly heavy corner shading (–2.1Ev) using the maximum f/1.8 aperture. This can be dealt with either by some correction in post-production, or by closing down a stop to f/2.8, which significantly reduces the vignetting effect. In third place overall for all 85mm primes we’ve tested on the EOS 5DS R, the Tamron 85mm f/1.8 sits just behind the $4490 Carl Zeiss Otus 85mm f/1.4 and the now-discontinued Sigma 85mm f/1.4 EX, which has been replaced with the new $1199 Sigma 85mm f/1.4 Art that we have yet to test. 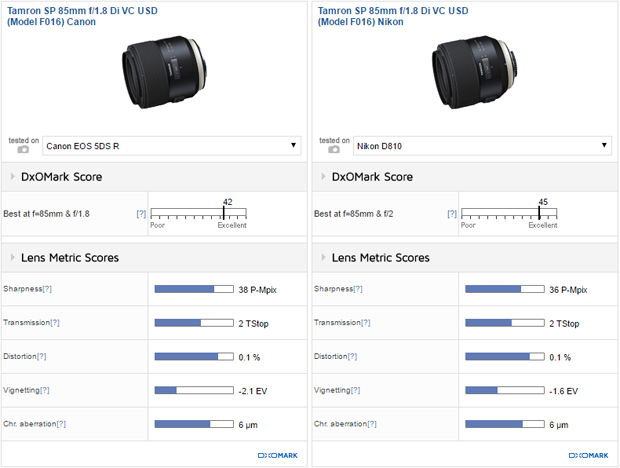 The Tamron lens also ranks ahead of both the Mark I and Mark II versions of Canon’s own $1899 85mm f/1.2L II, which sit in fourth and fifth place, respectively. If you’re after the very best 85mm lens, the Zeiss Otus wins in all categories except distortion on the 5DS R, and offers an extra stop of light transmission with its maximum f/1.4 aperture. The Tamron is not far behind on any measurement, however, which is an exceptional result for a lens that’s nearly $4000 cheaper. The Tamron also achieves better results in many categories compared to the Canon own-brand option, too, although of course the Canon’s f/1.2 maximum aperture and better light transmission bring specific advantages in terms of background bokeh and easier use in low light. Those factors aside, the cheaper third-party 85mm is significantly sharper overall on the 5DS R and displays slightly less distortion and chromatic aberration, too. Scoring 23 P-Mpix for sharpness, the Canon lens realizes less than 50% of the 5DS R’s 50.6Mp resolution, with softer edges at the wider aperture settings up to f/2.8 compared to the Tamron. If we consider the performance of the Canon– and Nikon-mount versions of the Tamron 85mm f/1.8, the Nikon version comes out on top for sharpness and low-light performance. Its better overall score of 45 points when attached to the 36Mp Nikon D810 (compared to 42 points on the Canon 5SD R) is a reflection of the improved low-light performance possible when used on the Nikon DSLR. 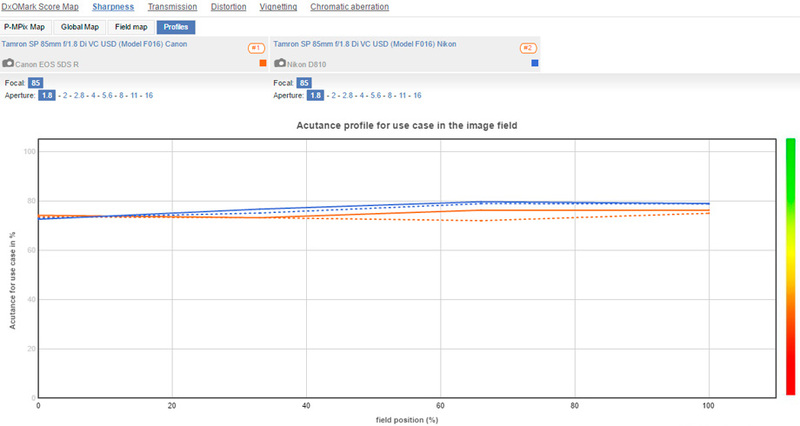 Although the Nikon version’s headline sharpness score of 36 P-Mpix on the D810 is lower than 38 P-Mpix recorded on the EOS 5DS R, you can see from the sharpness profile at f/1.8 that the Nikon version offers improved acutance at all field positions past 10% and achieves nearly 80% acutance from 40 to 100%, which is impressive at f/1.8. Vignetting at f/1.8 is moderately better on the Nikon version, too, but the rest of the lens metrics remain the same. The Tamron 85mm f/1.8 is the highest-scoring of all the 85mm prime lenses under $1000 that we’ve tested on Canon full-frame DSLRs. Securing excellent all-round lens metric results, it delivers outstanding overall sharpness, with high levels of acutance and uniform edge-to-edge sharpness at all aperture settings. 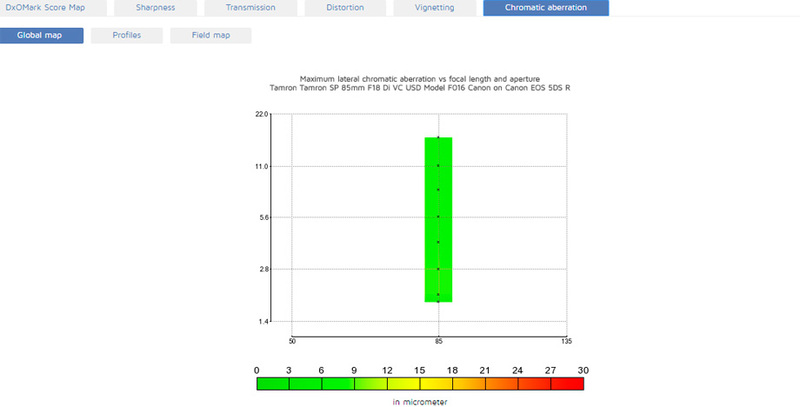 Although it achieves its highest sharpness score on the EOS 5DS R, the Tamron 85mm f/1.8 actually squeezes out more of the resolution potential of the 5D Mark IV and 1Dx II cameras. Excellent image quality is allied with a good set of features, too, including Tamron’s VC image stabilizer and USD autofocus motor, which improve low-light performance. Its maximum f/1.8 aperture has lower light transition compared to the Zeiss Otus 85mm f/1.4 and the Canon 85mm f/1.2L II, which could be an important factor in your buying decision, but these faster-aperture lenses also cost significantly more. The new Sigma 85mm f/1.4 Art will probably give the Tamron a good run for its money in a similar price bracket (and we’ll bring you those scores as soon as possible), but for now the Tamron short telephoto 85mm prime lens offers the best value for Canon full-frame shooters. For greater insight into the performance of alternatives to the Tamron 85mm f/1.8, see our 5D Mark IV, 5DS R and 1Dx II best lens reviews and our in-depth Zeiss Otus 85mm f/1.4 review.